Anyone who has never made a mistake has never tried anything new. -- Albert Einstein. Here are a few mistakes that I made while working at UNIX prompt. Some mistakes caused me a good amount of downtime. Most of these mistakes are from my early days as a UNIX admin. Again, I had no backup. I had sym links for my web server docroot (/home/httpd/http was symlinked to /www). I forgot about symlink issue. To save disk space, I ran rm -rf on http directory. Luckily, I had full working backup set. I made changes to sshd_config and changed the ssh port number from 22 to 1022, but failed to update firewall rules. After a quick kernel upgrade, I had rebooted the box. I had to call remote data center tech to reset firewall settings. (now I use firewall reset script to avoid lockdowns). In 2006 ORDB went out of operation. But, I failed to update my Postfix RBL settings. One day ORDB was re-activated and it was returning every IP address queried as being on its blacklist. The end result was a disaster. All men make mistakes, but only wise men learn from their mistakes -- Winston Churchill. Use CVS to store configuration files. Wait and read command line again before hitting the dam [Enter] key. Use your well tested perl / shell scripts and open source configuration management software such as puppet, Cfengine or Chef to configure all servers. This also applies to day today jobs such as creating the users and so on. Mistakes are the inevitable, so did you made any mistakes that have caused some sort of downtime? Please add them into the comments below. Process control and the ability for inter process communication is handled by the Linux kernel. accton - Turns process accounting on and off. Uses the file /var/log/pacct. To turn it on type "accton /var/log/pacct". Use the command with no arguments to turn it off. lastcomm (1) - Display information about previous commands in reverse order. Works only if process accounting is on. nice - Set process priority of new processes. ps(1) - Used to report the status of one or more processes. pstree(1) - Display the tree of running processes. renice(8) - Can be used to change the process priority of a currently running process. sa(8) - Generates a summary of information about users' processes that are stored in the /var/log/pacct file. skill - Report process status. snice - Report process status. top - Displays the processes that are using the most CPU resources. In this situation nice and ionice can be used. * ionice reduces the priority of a process on disk access. other program is making use of it. for all programs launched within this shell). This is useful in the scripts launched in /etc/cron. User contributed tutorial written by Ramesh Natarajan. Following are few situations where you may be interested in performing a filesystem benchmarking. => Deploying a new application that is very read and write intensive. => Purchased a new storage system and would like to measure the performance. => Changing the RAID level and would like to measure the performance of the new RAID. This article gives you a jumpstart on performing benchmark on filesystem using iozone a free Filesystem Benchmark utility. Note: You can install iozone under any UNIX / Linux or Windows operating system. Execute the following command in the background to begin the performance test. Let us review all the individual parameter passed to iozone command. -R : Instructs the iozone to generate excel compatible text output. -l : This is the lower limit on how many process/threads needs to be started by iozone during execution. In this example, iozone will start 5 threads. -u : This is the upper limit on how many process/threads needs to be started by iozone during execution. In this example, iozone will not exceed maximum of 5 threads. If you set -l and -u to the same value, it will run exactly those many number of process/threads. In this example, this will execute exactly 5 threads. -r : This specifies the record size. In this example, the record size for benchmark testing is 4k. This is an important parameter to be set appropriately depending on the purpose of your filesystem performance testing. For e.g. If you are performing benchmark on a filesystem that will host a database, it is appropriate to set this value to the DB block size of the database. -s : This specifies the size of the file that needs to be tested. In this example, iozone will try to perform test on 100Mb file. -F : Specify the temporary filename that should be used by the iozone during testing. The total number of files specified here should match the value specified in -l and -u parameter. 3. Analyze the output of iozone file. The first part of the output will contain the details about every individual filesystem performance metrics that was tested. for e.g. Initial write, rewrite etc as shown below. Similar values like above will be generated for readers, re-readers, reverse readers, stride readers, random readers, mixed workload, random writers, pwrite writers, pread readers. The last part of the iozone output will contain the Throughput summary for different metrics as shown below. 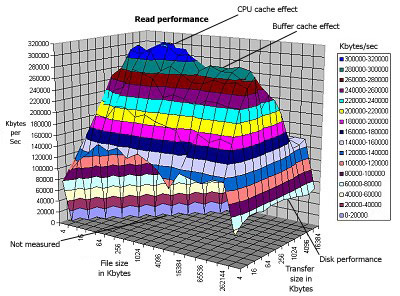 Iozone does a benchmarking on different types of file system performance metrics. for e.g. Read, Write, Random read. Depending on the application that you are planning to deploy on that particular filesystem, pay attention to the appropriate items. for e.g. If the filesystem hosts an read intensive OLTP database, then pay attention to Random Read, Random write and Mixed workload. If the application does lot of streaming media content, pay attention to the Sequential Read. On a final note, you can generate graphs using the Generate_Graphs and gengnuplot.sh located under /opt/iozone/bin, based on the iozone output. Iozone PDF documentation – Full documentation from iozone.org explaining all the iozone command line options and more. Linux Iozone graph example - This is a sample *.xls file from iozone that shows the kind of excel output that can be generated from iozone. This article was written by Ramesh Natarajan. At the The Geek Stuff blog he shares his knowledge and experience on Linux and other Geeky stuff. He has more than 15 years of experience in IT industry and has performed very intensive work on Linux system administration, DBA, Hardware and Storage. nixCraft welcomes readers' tips / howtos. creating Debian packages (.deb's). This detailed how-to shows all the necessary components of a package and how to put them together to end up with a final product. The Debian packaging system is one of the most elegant methods of installing, upgrading, and removing software available. For all you fans of other packaging systems, before you send your flames, please note that I said "one of" and not simply "the most." Other packaging systems have their charms, but in this article I'm going to focus on the Debian packaging system. Specifically, I'm going to look at creating Debian packages so you can distribute your packages in Debian format -- or simply create packages for your own use. I'll walk through the basic components of a package, what you need to create your own packages, and finally how to pull it all together to create a package. In this section, we'll take a quick look at what Debian packages are. Debian packages are much like RPM (Red Hat Package Manager) packages, but they differ a little in the details. If you've already worked with creating RPMs, you'll probably find that it's not at all difficult to add Debian packaging to your repertoire. What is a package, exactly? To put it very simply, a package is a collection of files with instructions on what to do with them. A package usually contains a program or programs, but sometimes it has only documentation, window manager themes, or other files that are easier to distribute in an installable package. The package contains instructions on where those files should reside in the filesystem, what libraries or other programs the contents of the package are dependent on (if any), setup instructions, and basic configuration scripts. Note that many packages cannot be used or should not be used with the default settings contained in their configuration files. With packages such as Apache, you'll still need to configure your installation after the package has been set up. Packages usually contain precompiled software, but you can also package source code. Some admins may prefer to install from source, or your application may require customization prior to compilation, so if you're distributing software that is under a free or open source license, you may wish to create a source package as well as a "binary" package. Note: Pre-compiled software packages are usually called "binaries," although this is something of a misnomer. Yes, executables are in binary format, but so are JPEGs, MP3s, and many other non-executable files. It would probably make more sense to call precompiled software "executable" packages. All binary Debian packages consist of three basic things: a text file called debian-binary, a compressed tarball called control.tar.gz, and another compressed tarball called data.tar.gz. The debian-binary text file contains the version number for the binary package, which should be 2.0. The control.tar.gz file contains the control file; the postinst file, which contains instructions on what to do after installing the package; and the prerm file, which contains removal instructions. control.tar.gz may also contain a file with information about configuration files for the package called conffiles and a file with the MD5 checksums for the package called md5sums. The data.tar.gz contains the actual "payload" of the package. That is, it contains a filesystem with all the relevant files for your program that, when installed, will be placed in the appropriate spots in your system's filesystem. If you want to see what a package looks like for yourself, download a few packages from the Debian site (see the link in the Resources later in this article) and run ar -x packagename.deb. Debian packages are simply archives of the files mentioned above. Do I need to be a Debian Developer? You don't need to be an official Debian Developer to create and distribute Debian-compatible packages. However, you do need to be a Debian Developer to actually upload packages and be a package maintainer for official Debian releases. If you're interested in becoming a Debian Developer, you can start by reading the "How You Can Help?" page on the Debian Web site (see Resources for a link). There are a number of companies and projects that create and distribute Debian packages of their software. These are not "official" Debian packages, but they're still of great convenience to Debian users who wish to be able to install software using dpkg or APT (Advanced Packaging Tool). Obviously, you're going to need a current Debian system if you're going to create and test Debian packages. You'll also need to have something that you want to package. We'll start with the assumption that you already have those two things and go from there. There are several packages that you'll need to have installed to build packages on a Debian system. Most of those packages will likely be installed by default, since you'll need dpkg, gcc, make, and so forth on most systems anyway. You will need the build-essential package and dpkg-dev package as well, which may or may not already be installed on your system. If you've used Debian for any amount of time, you might have noticed that Debian package files all follow certain naming conventions. Every Debian binary package should have a filename that follows this format: packagename_version_arch.deb, where "packagename" is the name of the package, "version" is the package version with major, minor, and revision numbers, and "arch" is the architecture for the package. The name of the package itself (not the filename, just the name of the package) can contain lowercase letters, numbers, and the "-" and "+" characters. (It might sound odd for a package to have a "+" in the package name, but it is used for several packages like "doc++" -- a documentation system for C/C++ code.) So, "mypackage-2++" is a perfectly valid package name, while "MY_Package" or "mypackage2.0" would not be. Every package should also have a unique name that doesn't already exist in the Debian archive. Even though you technically do not need to adhere to this for your package to install, you should be sure that your package name does not conflict with an official Debian package. For example, if you wanted to distribute a specially patched version of Apache as an alternative to the official Debian version, you shouldn't use apache_X.X.X-i386.deb, because the Debian folks already have an apache package. Instead, you'd want to use something like acme-apache_X.X.X-i386.deb. Now that we've covered the basics, what packages are, and what you need, it's time to talk about the nuts and bolts of building packages. You'll need to create a control file for your package. Don't worry; it's not very hard and all you need to create the file is your favorite text editor and a little information. The following is a sample control file. Note that I've included all the optional fields here for demonstration purposes -- your package is unlikely to need all of these fields. The syntax for the control fields is very simple: the name of the field, followed by a colon, and then the body or value of the field. So, "Fieldname: value" is all you need. Some fields require a one-word value, while others allow a free-form description or set of values. In this section we'll look at what each field in the control file means and what kind of information you need to provide. Most of these fields are optional, so your package will not have to include every field described here if they aren't relevant to your package. For example, a package will not require the "Source" field if source for the package is unavailable. If your package won't conflict with any other packages, then you need not include the "Conflicts" information, and so on. The first field in any control file is the "Package" field. In this field you'll specify the name of the package. The next field, "Version" is the version number for the package. You may use whatever version numbering scheme the original author of the package uses, but it may not include a hyphen. Anything after a hyphen is considered the Debian revision number. For example, if a program's native version number is given as 1.01-1 for some reason, the version number would be considered "1.01" with a Debian revision number of "1" -- clearly, not the result you're looking for. The "Maintainer" field should be your full name (or company name) and an e-mail address contained within angle brackets as shown above. The "Installed-Size" is pretty self-explanatory. As you probably already know, one of the nicest things about Debian packages is the dependency resolution. When you use apt-get to retrieve packages, it automatically decides whether you have what you need on your system to use the requested package, and offers to resolve any conflicts you might have or retrieve any packages you're in need of. That feature depends on the package's dependencies being well thought out and properly set up in the package. There are several optional fields that deal with dependencies. We'll cover each of them briefly here. Be sure you've sorted out exactly which packages your package may depend on before installation -- the dependency system is only as smart as the developers giving it information. Dependencies make up five of the fields in a control file: Depends, Enhances, Pre-Depends, Recommends, and Suggests. The Depends field should contain the name of any packages that your package absolutely needs to work. If there's a "nice to have" package related to yours, but not required for normal operation of your package, then you should use the "Recommends" or "Suggests" fields instead. You'll note in the example above that the "Recommends" field has two separate package separated by a pipe (|). This means that either package will satisfy the dependency; both are not required. What's the difference between "Recommends" and "Suggests," anyway? Any packages that you should probably have, but are not absolutely required, belong in the "Recommends" field. According to the policy manual, "list packages that would be found together with this one in all but unusual installations." Packages that are likely to be useful but aren't in any way required should be listed in the "Suggests" field. For example, the DocBook XML DTD package (docbook-xml) lists the DocBook SGML (docbook) package as a recommended package, and the DocBook documentation (docbook-doc) as a suggested package. In most circumstances, if you have the XML DTD, you'll probably have the SGML DTD too -- but not in every instance. It's usually (read: always) a good idea to install documentation about a package or related programs, like the DocBook docs, but it's not necessary for normal operation of your program. The "Enhances" field is basically stating that your package may make another package more useful. So, the docbook-doc package might have an "Enhances" field with docbook-xml as one of the packages enhanced. The "Pre-Depends" field is reserved for special cases. When a package is listed as a "Pre-Depends," it forces the system to make sure that the named packages are completely installed before attempting to install your package. Finally, when working with version numbers, there are several symbols you'll need to understand. You'll note that one of the packages listed as a dependency has a version number given, acme-base (>= 1.2). This means, "this package requires the package acme-base version equal to or higher than 1.2." The relations available are strictly earlier (<<), earlier or equal (<=), equal to only (=), equal to or later than (>=), and strictly later than (>>). The "Conflicts" and "Replaces" fields specify packages that are not dependencies, but rather packages that don't belong on the system at the same time as your package. Packages that conflict with your package outright should be listed in the "Conflicts" fields. For example, if you're packaging a modified version of Apache, you won't want the normal version of Apache to be on the system as well as yours -- so "apache" would be listed as a conflict. Finally, the control file should be located under a directory named DEBIAN, as should the scripts we discuss in the next section. This directory won't turn up in the final Deb archive. The postinst script should contain any necessary steps to be done after installing your program. The prerm script should contain instructions on what should be done to remove the program. Both of these scripts are required (see Resources for more on this). You'll use the dpkg command with the -b or --build option (-b and --build are the same). The syntax for creating a package is dpkg -b directory packagename.deb where directory contains the filesystem tree with all the requisite files for your program. Note, you can build the package without specifying the name of the new package, but then it will simply place the package file under directory as ".deb" -- which might lead you to believe that the package wasn't created at all. So, for example, if your program has a configuration file that belongs in etc/, the program itself, which will live in usr/bin/, and some documentation that lives under usr/share/doc/package/, you'll recreate that filesystem tree in a directory that will be used to create your package. That's pretty much all there is to creating a Debian package. It might seem a bit complicated, but really it's just a number of simple steps. None are too complicated; you simply have to get them all right. There are a few intricacies of creating packages that are beyond the scope of this article. For example, if you're packaging a mail user agent or mail transport agent, there are some specific considerations that apply. This article only covers the bare basics of creating a Debian package. Make sure you check the Debian Policy Manual (see Resources for a link) to make sure you're in full compliance with the guidelines for packages. There are several categories of programs that require extra attention, including any Web servers, daemons, Perl programs or modules, X programs, and so forth. You'll find what you need to know in the Customized Programs section of the policy manual. Find official Debian packages on the Debian Web site. Read the How You Can Help page to find out about helping with the maintenance of Debian packages. Why Debian? As debianPlanet explains, Debian is more than a distro and more than an OS -- Debian is a community. Depending on your mood today and other variables, this might sound great, or it might sound like a lot of hooey. Better to suspend judgment until you can read about Debian for yourself. Read the Debian Free Software Guidelines for licensing requirements for official Debian packages. The Debian Policy Manual contains instructions on making Debian packages, as well as additional topics. The RPM-for-Unix HOWTO covers converting Debian packages to RPM. You can also make both RPM and deb packages from one source with tools like pkgwrite. Read this article series by Dan Poirier on packaging software with RPM: Part 1 (developerWorks, November 2001), Part 2 (developerWorks, December 2001), and Part 3 (developerWorks, February 2002). For a tarfile-based alternative to package management, read Manage packages using Stow (developerWorks, February 2003). If you are interested in learning more about Debian or if you're having trouble, there are a great many Debian mailing lists that can help you. We need hardly add that, as always, you should check the archives before posting any questions to the lists. Basics of the Debian Package Management System contains a sample Debian control file, among other useful samples and explanations. The Debian Policy Manual, Chapter 6 has more information on Package maintainer scripts. Don't forget to keep up with the Debian Weekly News. For information on building your next application using IBM tools and middleware, check out Speed-start your next Linux app.